I do not propose to relate in detail a legend already so well known, or examine the history behind the drum: this has already been expertly done by Cynthia Gaskell Brown. However, I do propose to say what makes me think that the drum legend might have some basis in fact. Firstly, the legend was not created by the respective poems of Henry Newbolt and Alfred Noyes; neither was it the product of Victorian jingoism. Newbolt and Noyes utilised a well publicised existing legend. The drum was present in the Abbey in 1799. The folklorist Robert Hunt recorded in the early 19th century, that Betty Donithorne, an ex-housekeeper at Buckland, had told him that, "If the old warrior hears the drum that hangs in the hall of the Abbey and which accompanied him around the world, he rises and has a revel." Brixham fishermen claimed to have heard the drum beating during the Napoleonic Wars. Therefore, the legend dates from the 18th century: well before Newbolt and Noyes. Of course, being over 200 years old, does not add truth to the legend. However, I believe that Drake was the creator of the legend. In the last hours of his life, Drake was seriously ill. He was delirious and, according to an eye-witness, "...raved in words which nobody cared to record." Some of these words could have given rise to the legend: words that he did not mean in the sense which they were taken and caused the drum to be preserved in the Drake family. There is no evidence whatsoever that the drum accompanied Drake on his circumnavigation, or that it had any particular significance to him personally. It may have been one of the number of side-drums which were listed in the bills of lading for that sad voyage, but we do not know for certain. The drum dates from the 16th century. For some reason it was immediately placed in Buckland Abbey and has been constantly cared for by the Drake family. Thomas Drake and his immediate descendants, must have been the ones who initiated the family care. 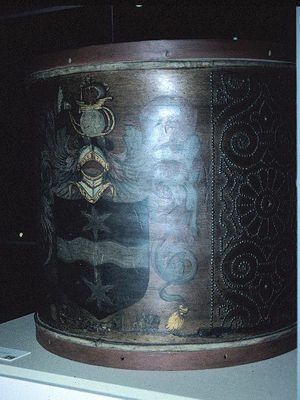 According to Lipsoombe, Lady Elliot Drake and Isaac Foot, the drum has been on frequent display since the 18th century. This role continued because England wished it to be so! The children's novel, Knight of Stars and Storms has popularised the belief in the strange powers of Drake's drum. According to the author, you do not even have to strike it: just talk to it nicely. An earlier children's book, Merlin's Magic also had the outcome of the story hingeing on the drum's supernatural powers. The television programme Casualty got to the crux of the matter in the episode called Drake's Drum . The legend of Drake's drum and Drake as England's protector, is obviously not true. However, what matters is that people believe it to be true.